In Danish, JERN means IRON, which refers to the cabinet material. We use a special grade grey cast Iron (Vibrakill TM), with a very high amount of Graphite (Carbon) mixed in the Iron. The Graphite dampens our cabinets vibrations 100 times better than Aluminium, and much better than MDF and wood. Iron is also much stronger and heavier. This also reduce cabinet vibrations, so you only hear the good sound from the loudspeaker cones. 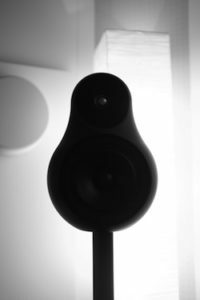 JERN14 differs from other high end speakers because the choice of material and casting method allows our designers and engineers to create new shapes that improve the performance instead of regular square boxes that compromises the sound quality. Sound quality is an assessment of the accuracy and enjoyability, when it comes to audio output from an electronic device. Sound is all about transferring the soundwaves out of the loudspeaker drivers to you, and reducing disturbing vibrations and noise from the cabinet. Different materials give different vibration levels. Traditionally, speakers are made from wood because of its low cost and ability to reduce vibrations. JERN focuses on the perfect sound, which is the cornerstone in our production, design, components and choice of materials. JERN12, JERN14 and JERN w8000 loudspeakers are made from vibration absorbing greay cast iron that reduce vibrations up to 100 times better than Aluminium. Our cabinets are also much better than MDF and wood. This is our key component to the clear and clean sound that the JERN loudspeakers delivers. Drive Units Scan-Speak woofer 5 1/4 inch 149 mm frame. Very smooth frequency reponse +- 2dB op to 9 kHz. Excellent Midrange Performance · Low Damping SBR Rubber Surround · Coated NRSC Fibre Glass Cone · Die cast Alu Chassis vented below spiderHiquphon small 20 mm textile and metal dust dome tweeter with a extra long excursion of +-0,9 mm, excellent for 6 dB / Octave phase linear filters. Comments These JERN 14 loudspeakers need to work with high quality subwoofers. Compared to the JERN 14 ES, the EH version has a better Mundorf EVO Silver Gold Oil capacitor and the superb Hiquphon golden dome tweeter. Crossover The phase linear 6dB/octave custom-made crossover uses a Mundorf polypropylene capacitor and an air core coil. It delivers a fine 3D soundstage.